Apple stores in mainland China are using a reservation system this time around to launch the company’s new iPad, months after its iPhone 4S launch in the country resulted in an irate customer throwing eggs at a Beijing store, while leaving hundreds of customers disappointed. But in January, the launch of the new iPhone 4S in China turned ugly, when hundreds of customers had waited outside Beijing’s Apple Store in the Sanlitun district, only to later be told the store would not open for the day. Apple gave no explanation. 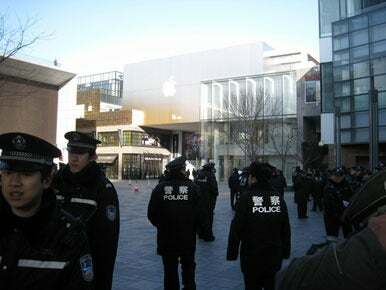 Local police had to clear the area around Apple's Beijing store in the Sanlitun district after a crowd became unruly during the white iPhone 4's debut in that country. Apple is hoping to avoid problems with the third-generation iPad launch in China by implementing a reservation system. Apple’s Beijing store in the Sanlitun district was previously the site of another skirmish relating to the sale of the white iPhone 4. Customers broke the store’s glass door, following a dispute with company security workers. On Thursday at around noon local time, Apple’s Sanlitun store did not have waiting customers, as the store displayed a sign stating the new iPad could only be bought with a reservation made online. While new for mainland China, the reservation system has already been put to use in nearby Hong Kong, where demand for Apple’s products has also been high, if not higher. Apple’s newest products have typically launched in Hong Kong ahead of mainland China. This has caused scalpers to buy the product in Hong Kong, only to later sell them for higher prices in cities such as Beijing and Shanghai. Apple’s launch of the new iPad will be a good test case for the company to see if the reservation system will be effective in the country, said Nicole Peng, an analyst with research firm Canalys. But interest in the device could be significantly less than for previous iPad launches in China, she said. As Apple’s new iPad has been available in foreign markets for months, some Chinese customers have resorted to buying it from gray market vendors, who purchase the product overseas to later sell it locally. Apple is selling its new iPad in the country following a legal trademark battle with a local firm in the country that could have resulted in a ban on the sale of the tablet. Earlier this month, the company agreed to pay $60 million to the local firm to gain ownership of the “iPAD” trademark in China.